A favorite spring breakfast is roasted asparagus, scrambled eggs and bacon (or ham). We eat fresh asparagus daily in season and it truly is a favorite breakfast food. Today, we chose bacon (as we've eaten a lot of ham the last week or so!) and the salty bacon, the creamy eggs and the crisp asparagus make for the perfect breakfast trinity. Sometimes we serve plates and other times we serve family style -- with the eggs piled on a plate surrounded by bacon and the asparagus piled on another plate or platter and if we do the latter, we'll get out our silver asparagus fork (foreground) or asparagus tongs (background). Victorian pieces that are perfect for serving asparagus. And the bread for breakfast during Holy Week? Hot Cross Buns. Alas, not made by me! But rather bought at our favorite bakery. A family tradition, these hot cross buns. Another family tradition, they've always been bakery buns! 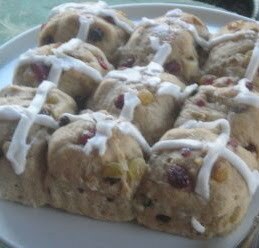 It's Friday -- Good Friday -- the day Hot Cross Buns are traditionally eaten. So please join Michael at Designs by Gollum to see other fabulous foods this Friday. Now, darlin' lady, you are talkin' my kind of talk...bakery hot cross buns are absolutely delicious and, yes, we will have some, too. I've never had them with scrambled eggs and hem but I love the idea! We love asparagus for breakfast, too. I lightly sautèed (already cooked)diced red potatoes, a little oniion then toss in cut up asparagus...served with a little hollandaise, scrambled eggs, w/w toast and it is a breakfast fit for royalty! I love fresh asparagus, but have never eaten it for breakfast before. You have inspired me to have it for Easter breakfast this year! Have a great weekend! Perfection on a plate. I love asparagus too, especially with our own free range eggs. That is the sort of breakfast my husband would love, but only occasionally!! I often serve asparagus with dinner for him, I am not too keen on it. Happy Easter, Jackie in UK. I should not be looking at this first thing in the morning...I am SO hungry now. I love asparagus but have never eaten it for breakfast. It sounds delicious with eggs. Agree, a perfect spring breakfast, Martha. I'll have one of those hot cross buns, if you don't mind :) Happy Easter! I didn't know that there was a special serving piece just for asparagus (my favorite vegetable!) I have my own asparagus steamer, but mostly I prepare it like you did. Now I must find a server...Thanks for sharing your lovely breakfast with us.